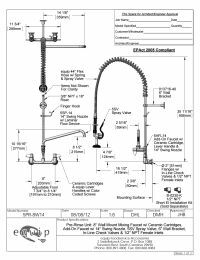 The equip by T&S Brass 5PR-8W14 Wall Mounted Pre-Rinse Unit features a 14" add-on swing nozzle. It installs with 8" centers and includes a 6" wall bracket. The 5PR-8W14 has built-in check valves and flows at a rate of 1.42 gpm at 60 psi.